I know you're not suppose to say that, it sounds bad. Unloving. But, it's true. There are three conditions that need to be met no matter if my love is to be given to a friend, lover, or even family member. And if these aren't there then my love won't bloom, grow, or will die very quickly. 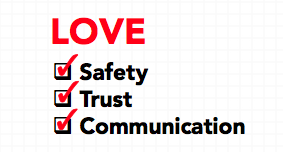 Safety: Maslow and I agree, safety is one of our key needs and in a relationship of any kind I need to feel the other person is not a physical or emotional threat so I can relax and be myself. Domestic abuse is a huge issue even today but I don't mean solely being afraid someone might hit us. I also mean they might leave us in an unsafe environment either physically or mentally. None of my close friends are smokers because I can't breathe around smoke. Even though I was raised with guns in my house as a kid, I wouldn't date someone who openly carried one just for their amusement. I wouldn't be friends with someone who refused help and chose to stay in an abusive marriage, drove unsafely while I was in their car, abused substances, had an explosive temper, or endangered themselves on purpose. Because if someone is not concerned with their own mental or physical well being, they surely won't be concerned about mine. Communication: I'm done with any relationships where communication is a guessing game. As I got older I thought that adulthood meant that when a problem popped up the folks involved would sit down and resolve it like "grown ups". Turns out if someone avoided issues in their 20 and 30's they're not going to find themselves magically in their 40's cleaning up their messes and working things out. More likely they'll just leaves bigger messes in their wake. And to that I say: no thanks! Love is not enough to get us through when we are not safe, trusting, and communicating with the people we proclaim to care so deeply about. It's just not. Because to truly love someone else we need to value ourselves enough to ensure our relationships are healthy.